Muslims gather for outdoor "Jumah" prayers at Marshall Park in Charlotte, N.C., on Friday, the first of several events planned by the Bureau of Indigenous Muslim Affairs in the run up to the Democratic National Convention in the city. 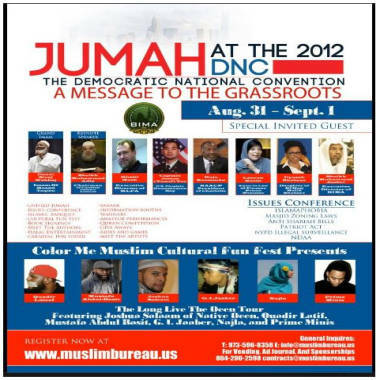 A flier for Muslim events timed for the run-up to the Democratic National Convention in Charlotte. 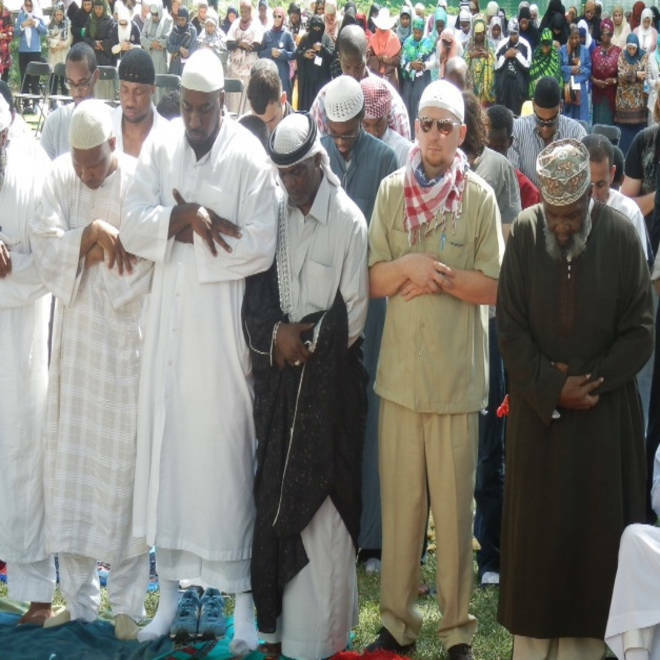 In the run-up to the Democratic National Convention, several hundred Muslims attended "Jumah," or Friday prayer, in a park in Charlotte, N.C., as part of an effort to mobilize Muslims and get them engaged in political discourse. But the event sparked some of the same negative reaction that the organizers were hoping to combat. Organizers said they hoped to use the prayers, a town hall meeting planned for Saturday and cultural festival to open events to non-Muslims and bring attention to problems that they believe disproportionately affect Muslims but are ignored by both political parties. They cite what they consider invasive practices under the Patriot Act, discrimination against mosque construction through the use of zoning laws, "anti-shariah" bills being passed by state and local governments and more generally a climate of Islamophobia. "One of the reasons for pulling folks together is to stay focused," said Jibril Hough, one of the organizers from the nonprofit Bureau of Indigenous Muslim Affairs, or BIMA. "A lot of our issues that we are going to be bringing up will not be discussed by RNC or DNC. Both parties have supported deals that are eroding our civil liberties." While about 300 Muslims prayed in Marshall Park in downtown Charlotte, the Christian group Operation Save America showed up to protest. Islam is one of the three main targets of its protests, along with abortion clinics and gay rights events. A news release from the organization on Thursday explained its reasoning. "Hatred toward the God of the Bible (Jesus) is the great unifier of abortion, homosexuality, and Islam," said the release. "Hatred toward God and the nation He made great – America, is the platform of the DNC." That protest had a permit and was anticipated, said Hough, and the police were poised to protect Operation Save America's right to protest without allowing them to disrupt the Muslim prayer. "I told (the leader of the protest) I support his First Amendment right," said Hough. "But just because you have the right to do something doesn’t mean you should do it." The BIMA events were posted alongside hundreds of others on the official web site of the DNC host committee, none of which is sanctioned or supported by the committee, to let people attending the convention know what else is going on in town. But the BIMA events were removed from the calender after negative publicity. Some critics of Islam described both Hough and the headline speaker, Imam Siraj Wahhaj, as Islamic radicals. In an interview on Fox television on Thursday, Zudhi Jasser, a controversial figure within the Muslim community who calls out "extremists" within his own faith, compared the views of BIMA to the KKK or the Nazi party, urging the DNC to distance itself from the event. "They clearly are part of the global Islamist movement and really are an insurgency within this country," said Jasser, an Arizona physician who says many American Muslim leaders hope to replace American democracy with rule by Islamic law. Meanwhile, in articles like this one in Frontpage.com, the right-wing blogosphere dissected Wahhaj's sermons and history, intimating that his conservative views were dangerous and embraced by the Democratic Party. A senior DNC host committee official confirmed that the BIMA events had been removed from the website's "upcoming events" page. "This event, like many others on the page, was user generated," a senior Host Committee official told NBC News on Friday. "Upon further review, and because speakers for the event and statements and positions from event organizers were not appropriate and relevant to the Host Committee, Charlotte in 2012 has decided to remove the event from our events calendar." "This is about caving in to fear and ignorance," said Hough. On the other hand, he said, the prayer event "was very open, open to all, in the public square. Thousands will read about it and further understanding of Muslims and what is important to us."